Parking lots can often feel unsafe but with these seven tips in hand, it’s easy to design a safe, secure parking lot or garage. Our interactions with parking lots are pretty minimal; you drop your car off, head through the lot or garage, and you get to your destination. Simple, easy, and unfortunately in many cases, somewhat unsafe. The trope that you may be attacked on the walk back to your car isn’t completely unfounded, as parking lots and garages are often poorly lit, only light staffed by security guards, and are missing optical security systems. For lots associated with buildings that have more sensitive security needs than a typical shopping mall, it can also be a huge liability to not properly secure those lots. 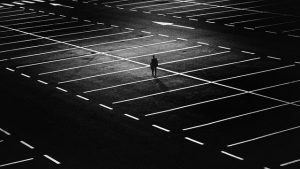 Try out these seven tips to ensure that a parking lot is safe and secure. Part of why crimes happen in parking lots and garages is because they’re typically so poorly lit and create an environment where wrongdoing can thrive. Installing more lighting is a good first step, but be certain to have some system in place to check for dead bulbs or any other lighting issues that may arise. Putting in advanced security systems is appropriate for lots that require more stringent security systems. This may include an intelligent license plate reader or even an intelligent driver camera. Either way, you gain much more information about who is entering the lot, which is an important element of security. Sometimes, the basics never fail—and that’s certainly true of fences. While not always applicable, there’s no doubting that fences serve as a great means of security. Preventing unwanted access is of the utmost importance. Emergency phones are most widely recognized as being a fixture on college campuses, but they have their uses elsewhere as well. Parking facilities are one such place where emergency phones just make sense. The wrong kind of landscaping makes for large trees that can be climbed or bushes that can be hidden in. If you do incorporate any elements of landscaping around the parking lot or garage, be certain that they act as a preventative barrier to stop unwanted entry. The right kinds of signs can help steer people in the right direction and the less time people spend wandering around a parking lot, the smaller chance there is of something happening to them. Additionally, signage indicating that the area is being surveilled and watched also serve to mitigate the risk of crimes happening. Educating the people who are going to be using the parking facility is one of the best ways to ensure they do so safely. Basic tips like not getting distracted by your phone while on the walk back to your car can go a long way in making sure people are safe. Some may also opt to walk together as people in pairs are much less likely to become victims of theft or other crimes. This entry was posted on Friday, November 30th, 2018 at 1:58 pm. Both comments and pings are currently closed.